The Palestinian Prisoners’ Society (PPS) has reported that Israeli soldiers abducted, on Monday at dawn, fourteen Palestinian in the occupied West Bank, including nine who were taken prisoner from their homes in Hebron. The Hebron office of the PPS, in southern West Bank, said the soldiers stormed and ransacked many homes, interrogated dozens of Palestinians and abducted nine. The abducted Palestinians have been identified as Oweis Hashem Rajoub, Mofeed Eqeilan Amayra, Karam Bassam Tanneena, Abada Mahmoud Adawi, Azzam Abu Arqoub, Raed Mofeed Sharabati, Ali Taleb al-Hroub and Mustafa Jamal al-Hroub. The soldiers also abducted a former political prisoner, identified as Mohammad Ahmad ‘Aadi, 60, from his home in Safa area, in Beit Ummar town, north of Hebron. In Bethlehem, the soldiers abducted Mohammad Nassim Taqatqa, Sami Awad Atallah and Yazid Mohammad Amarin. In addition, the soldiers invaded Methaloon town, south of the northern West Bank city of Jenin, and abducted Sami Sadeq No’eirat, from his home. Another Palestinian, identified as Qadri Ayyadh Ghawadra, from his home in Be’er al-Basha village, southwest of Jenin. On Monday morning, the soldiers prevented a Palestinian from entering his farmland, near Azzoun town, east of the northern West Bank city of Qalqilia, and threatened to confiscate his agricultural equipment. The soldiers told the Palestinian that he is not allowed to work on his land, and ordered him to contact the “Civil Administration Office” in Eyal nearby illegal colony and security center. 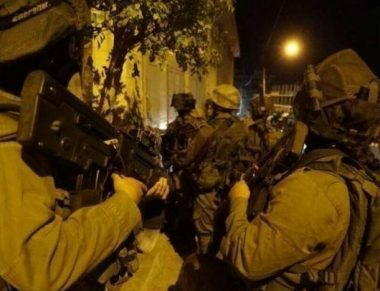 On Sunday at night, the soldiers abducted four young Palestinian men in Zabbouba village, west of the northern West Bank city of Jenin.